This past spring, they were all over California. With clipboards, cameras, and data sheets in hand, they were searching at a nursery or garden center near you — for invasive plants. 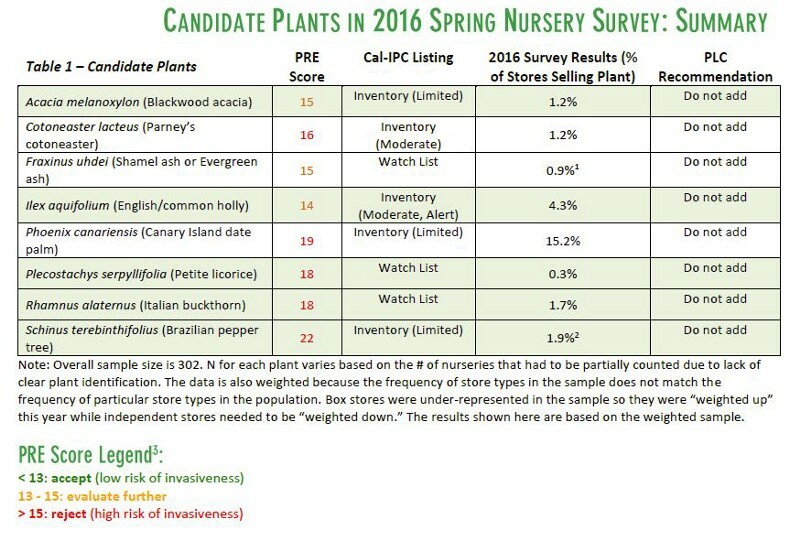 The nursery survey is how we measure what is happening in California’s retail nursery industry, and none of it would happen without our survey volunteers. This year 175 volunteers(many of them UC Master Gardeners) were trained by PlantRight to survey for invasive plants at retail locations throughout the state. New volunteers watch a webinar that discusses invasive plants, how to conduct the survey, and includes a guest speaker each year. This year’s webinar included a presentation by Dan Gluesenkamp from the California Native Plant Society about gardening with California natives and Calscape, their tool to help people find native plants for their garden. Returning volunteers can watch a refresher video but are welcome to join the webinar. After demonstrating their newfound knowledge and completing a quiz, volunteers have access to survey materials and are able to claim their survey store (or multiple stores). This year thanks to extra outreach efforts and dedicated volunteers, we were able to get more data than ever before — from 302 nurseries compared to 265 nurseries in 2015. One of those volunteers was Melanie Keeley, a board member of the Alta Peak Chapter of the California Native Plant Society. Melanie surveyed 7 stores in Kings and Tulare counties where we were unable to get data in past years. 1. Tracking the sale of invasive plants currently on our list, and retiring those that have been largely phased out of retail. 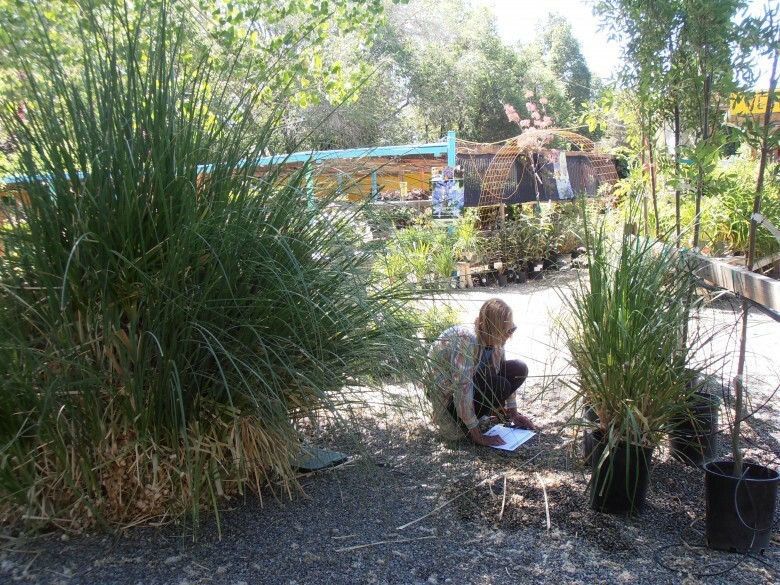 The first PlantRight invasive plant list was developed using the California Invasive Plant Council (Cal-IPC) Inventory as a starting point and included 19 plants, focusing on the highest priority invasive plants still sold in garden centers. After several years of working to phase out invasive plants from the industry, we decided in 2012 that the list needed an update. As plants from the original list are no longer sold, they are “retired.” To retire a plant, it must be found at less than 1% of nurseries surveyed for 3 years in a row. This doesn’t mean that they are gone from our landscapes. Plants like Scotch broom (Cystisus scoparius) and arundo (Arundo donax) have already invaded wildlands in California, and there’s still much work to be done to control their spread. Since our invasive plant list was first published in 2006, 15 plants have been retired, which is excellent progress. You can help with these retired plants by removing them if they are on your property or volunteering with groups that remove invasive plants. There are 7 plants currently on PlantRight’s list of invasive plants. The 2016 survey results for these 7 plants can be found in our Fact Sheet and Full Report. Four of these plants were part of the original list of 19: green fountain grass (Pennisetum setaceum),pampas grass (Cortaderia selloana), highway iceplant (Carpobrotus edulis), and big-leaf periwinkle (Vinca major). Three plants were added in 2014: Mexican feathergrass (Stipa/Nassella tenuissima), yellow flag iris (Iris pseudacorus), and water hyacinth (Eichhornia crassipes). We’ll go into that process next. 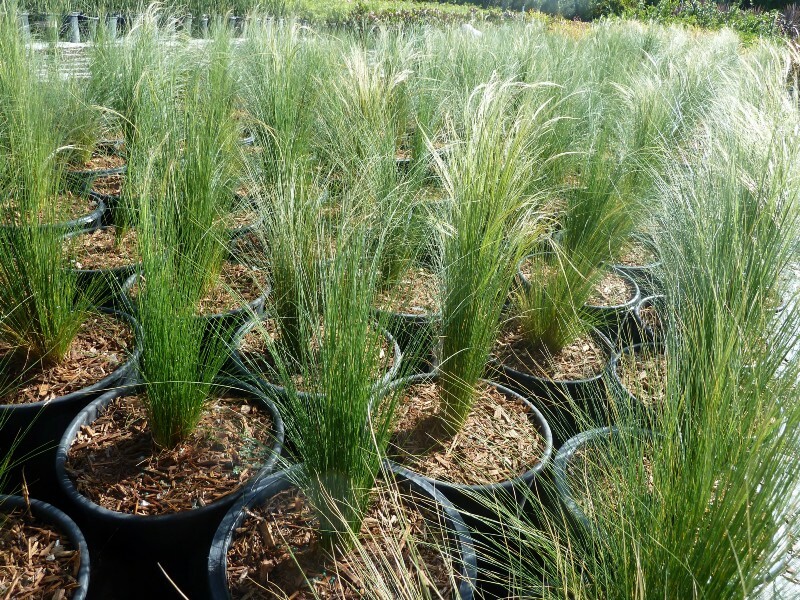 Rows of Mexican feathergrass (Stipa/Nassella tenuissima) at a nursery. While green during the wetter part of the year, this grass will turn golden brown at the top as its seeds ripen — its many, many seeds. Each plant can produce thousands of seeds, which are dispersed by wind, water, contaminated soil, automobiles, and animals. Photo by Jan Tilford. 2. Helping us determine whether or not to add candidate plants to the plant list. In late 2012, PlantRight recruited several horticultural experts (all volunteers, from diverse sectors of industry, academia and conservation) to establish our Plant List Committee. These individuals engage in the complex, involved, and time-intensive process of working with PlantRight to decide which surveyed plants to add to our invasive plant list and which non-invasive alternatives we should suggest. Each fall, PlantRight solicits input from our Plant List Committee and an extended network of experts to see what plants might be hopping the garden fence and escaping into wildlands. Once we have a list of possible candidate plants, we evaluate them using the Plant Risk Evaluator (PRE) and look at whether or not they are included in the Cal-IPC Inventory. Together with the Plant List Committee, we decide which candidate plants to include in the nursery survey. This year we surveyed for 8 candidate plants. If we were to add a new invasive to the list, we would work with our Plant List Committee to develop a list of non-invasive alternatives, inform our retail nursery partners and the industry through the California Association of Nurseries and Garden Centers (CANGC), and determine a phase-out timeline based upon input from our partners, and our Plant List Committee. Why were no plants added to the invasive plant list this year? An English holly (Ilex aquifolium) cultivar with variegated leaves. Photo by Mary Gish. Only two candidate plants this year met the first two criteria — English holly (Ilex aquifolium) and Canary Island date palm (Phoenix canariensis). Thankfully, the other 6 plants were found at less than 3% of retail nurseries. 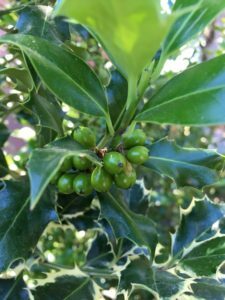 English holly was found at 4.3% of stores, but nearly all the plants found were cultivars (a cultivated variety) and not the straight species, which is what’s on the Cal-IPC Inventory. Some of these cultivars may be sterile and aren’t what has invaded wildlands. For many California gardeners there are better options, such as toyon (Heteromeles arbutifolia) for those who want a plant with red berries and it’s not a popular plant throughout the state. For these reasons, it was not deemed a high enough priority for addition to the plant list. 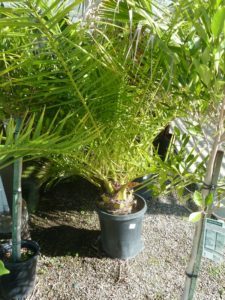 A young Canary Island date palm (Phoenix canariensis). Photo by Arthur Tilford. Canary Island date palm has a long history in California, and commands a high price for large specimens. Although it has invaded riparian areas in Southern California, it’s not invasive in large geographic areas of the state, and has a Limited rating on the Cal-IPC Inventory, which means it is invasive, but the impact is minor on a statewide level. It’s a plant with cultural and architectural significance, and a lack of readily available alternatives that are as hardy or grow at a similar rate. There’s also a disease killing these palms called fusarium wilt. It often spreads when rows of the trees are trimmed at once, transferring the disease from one plant to another. It can also enter through the roots — surviving in soil for at least 25 years. Although we aren’t adding any new plants to the list or retiring any plants for 2017, we will be pulling back the curtain on our plant considerations over the years and sharing more information about these candidate plants. Look for this information and more on our new website (coming in 2017). Visitors to PlantRight.org will learn why the plant wasn’t added to the list and the particular habitats or regions of California where the plant is invasive and should be avoided. We look forward to making this available and becoming an even more robust source of information about ornamental invasive plants in California. There’s one more way PlantRight uses the survey information, helping us use our energy and time strategically. Dean Kelch in a photo that was included in a presentation during the 2016 Steering Committee meeting. 3. Informing our industry outreach strategy with information about sales in different regions and store types. We have worked across the nursery supply chain to raise awareness about invasive plant issues and benefits of planting right. In recent years we’ve been recruiting retail nursery partners. These partners commit to sell exclusively non-invasive plants — you won’t find any plants on our plant list at a retail nursery partner’s store. Project Associate Christina Kohler leads our outreach to nurseries, and explains how the survey informs our work. Partnerships with big box stores have measurably decreased the sale of invasive plants at that store type. The Home Depot California became a partner in 2015, and the sale of invasive plants at big box stores decreased from 43% in 2014 to 16% in 2015. Lowe’s and OSH in California joined in 2016 and the percentage of invasive plants sold at big-box stores decreased once again to 6% in 2016. These stores also sell a large volume of plants, so partnering with them affects sales throughout the state and their leadership as problem solvers on this issue cannot be overstated. We appreciate our independent and small chain partners just as much. So many are educational hubs on planting right in their community, so it’s a natural fit. 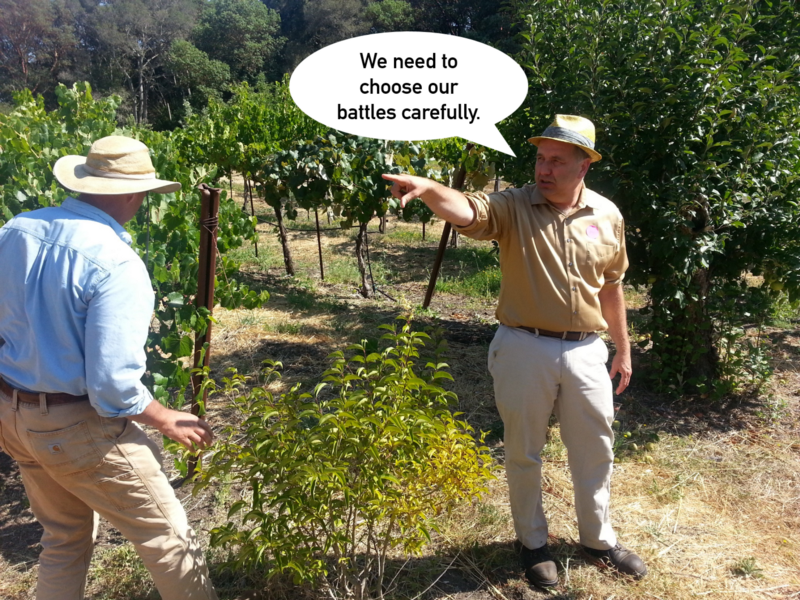 We will continue our outreach to nursery and landscape professionals and consumers to keep the momentum going, so that year by year, the sale of invasive plants in California will decrease. You can help by sharing what you’ve just read and our Plant List, by shopping at our retail partner locations, and speaking to someone at your favorite nursery about why planting right matters to you. 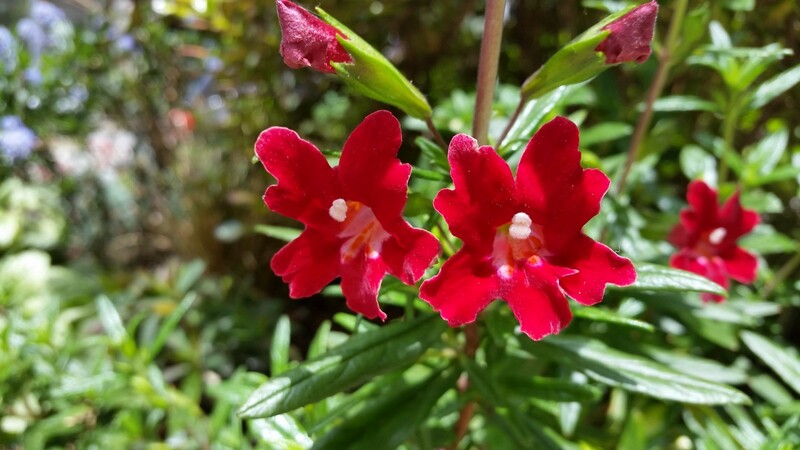 Monkeyflower growing in a container garden in San Francisco.